Mogensen's Carol Apartments in Burlingame (top), with its arrow-shaped corners (above). "Really cool little details," says Leah Maltos, the building's community manager. Slats are a common Mogensen device, used on apartment façades and commercial buildings, either attached to the wall or freestanding, sometimes porch railings, sometimes purely decorative, creating shadows and pattern. Many of his buildings buried parking beneath the structure, as in a small office building at 90 El Camino Real. 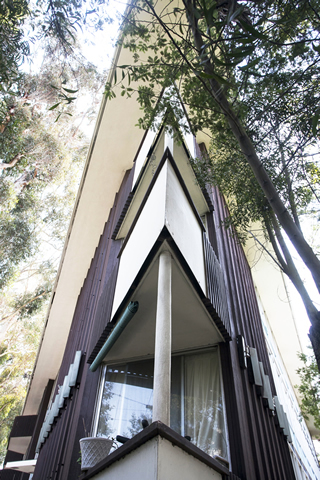 He played with shapes to fit his structures onto odd sites, as in this office, or in the arrowhead-shaped apartment across the street, the Carol Apartments at 55 El Camino Real. The architect often incorporated artwork into his apartments, a concrete frieze in the Ambassador Apartments in San Mateo, a metal sculpture at 500 El Camino Real in Burlingame, a lovely mosaic of what appear to be winged tigers by Cecelia Mogensen at the Park Central Apartments in Burlingame. The homes on Sunset Terrace, built in the mid-1950s, represent Mogensen's style at his purest. They're like Eichlers—cork floors originally, warm wood paneling, open beam. But in many ways they are quite different. Rather than unbroken expanses of sliding glass, Mogensen broke his glass up with wood mullions arranged in a distinctive way, both vertically and horizontally, a pleasant rhythmic device. The T-plan homes have a long living room with glass walls on the two long sides. Copper fireplaces in some homes add texture and color. Kitchens are bigger than in most Eichlers. Intersecting roof planes—some roof sections are single-slope, others flat or low-gabled—provide tall clerestory windows and an almost puzzling interplay of spaces, with one playful high shelf to accomplish—what? Shirley Taylor uses it to display her basketry collection. "The important thing about this house, to me, is the way the landscape works with the house itself," Taylor says. "The light comes in from the clerestories and plays off against the warmth of the wood." "When you walk down the hall you can see the full moon. It's very nice," says Suzanne Coberly, who lives in one of the houses with her husband Jeff Haas. "It's a good nature house. You can sit at the table and see birds in the tree." Today, 12 of the 13 houses built by Mogensen and partner Dan Cooper remain. One was lost to fire. Several are largely original both inside and out. Taylor's hasn't changed in any significant way. Mogensen, who divorced in the 1970s, quickly remarried. He never retired, Tom says. But business slowed in later years. "He had a sense of satisfaction about the things he did," Tom says. "But there was dissatisfaction too, that he wasn't getting the recognition he deserved. He battled with depression." Like many accomplished architects of his generation, Mogensen has been largely forgotten today. But not in Sunset Terrace. "This little cul-de-sac," says homeowner Steve Maskel, "is part of his legacy."